The Pittsfield, Massachusetts police department recently launched Operation Copsicle, a funding campaign to raise $10,000 to purchase an ice cream truck for the department. WNYT-13 reports police hope it will create positive interactions between residents—especially kids—and police. The department also created a video to help spread the word about Operation Copsicle. It shows an officer commandeering an ice cream truck—Mr. Ding-A-Ling Ice Cream Cart—and offering free treats to kids. 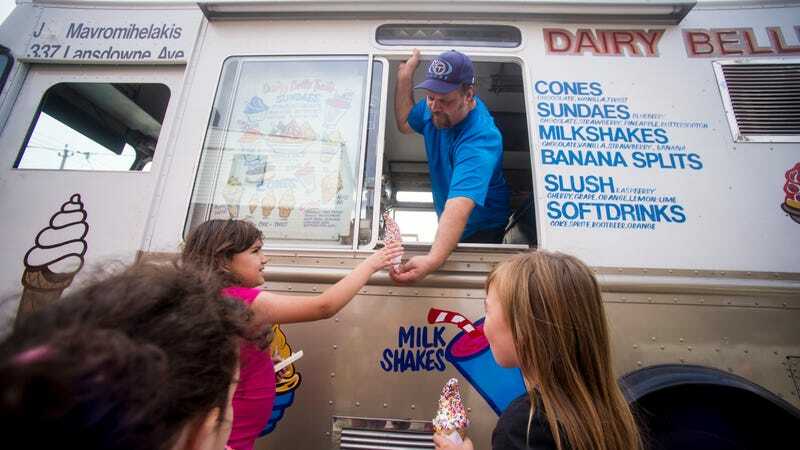 The kids go nuts for it, but there’s something potentially counterintuitive in teaching kids to approach white vans looking for the promise of ice cream. I’m 95 percent certain this was the thrust of all the “stranger danger” lectures in grade school. Still, it’s hard to beat free ice cream as a gesture of good will. Cops say they’d like to bring the truck to community events, as well as sending it to neighborhoods that have just experienced a crime or traumatic event.